As I mentioned last time, I drove the van up north on my last day off from work. It was the first really nice day in a while and I wanted to just go for a drive. Here's some pics from that. 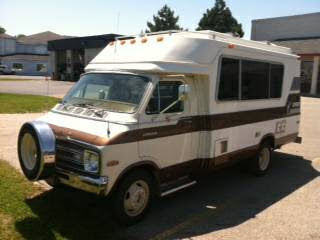 So I got more pictures of my newest motorhome interest. Even a video of the guy starting it up. Hard to tell if it sounds good in a cell phone video but still exciting. At this point, I love everything I've seen about it. I'm planning to head up there this weekend but it really makes a lot of thoughts and questions go through my mind. One thought process is obviously about money. I haven't asked the guy anything about price yet. It is a 'Best offer' listing and I would like to get the best price I can, but at the same time I am not a good haggler. He's asking $2500 for it. I guess I've kind of assumed I could talk him down to $2000, but I'd probably feel really good about it if I could get it for maybe $1800. Less would be amazing but I don't feel confident, at this point sight unseen, even thinking about offering less than that. Regardless, either way my savings would be practically wiped out. The next thought is am I ready. If I get a motorhome, that throws my plans into motion really quickly. I don't have the real estate to keep a motorhome sitting around without actually using it. There's a lot of mental things and also organizational things to think about. Can I actually LIVE in a motorhome in parking lots while working a regular job? Even without working a regular job, can I manage to live in parking lots in one overall area and get away with it? Having a job makes it easier in the aspect that I have somewere legit to be parked during the day. How hot will it get in the summer? I could, in theory, withstand the temps if I needed to but what about my cats? Especially in the heat of the day while parked at work. Will I be able to create some sort of air flow to keep them at least cool 'enough'? Am I ready to go against what my parents (probably) think and also the general public? On one hand I feel excited because I'd finally be doing exactly what I want like I used to do. Not care about anyone else's opinions and live life the way I want, and end up having people respect me and like that about me. I have more questions than just those. All great questions. In reality it's all just fear though. Fear of others. Fear of spending all my money. Fear of making a mistake. Fear of getting stranded. Fear. Here's a quick picture of the one I've been talking about!